At a time when many of the world’s dumb things are being imagined afresh for the 21st century, how can the toolbox be left behind? 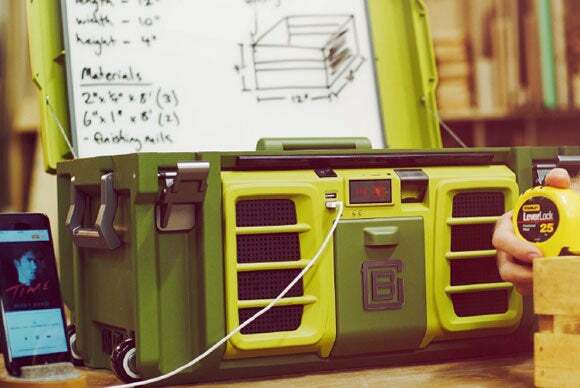 The Coolbox might be that inevitable smart re-imagining of the toolbox DIYers have been waiting for. It is the brainchild of two heavily (yet tidily) bearded Canadian entrepreneurs, Mike D’Agostini and Christopher Engelo, who saw an opportunity in the frustration that flows from having to tote to job sites everything from phone chargers to speakers to the tools themselves. They knew there had to be a better way to do this and came up with the Coolbox, an LED-lit toolbox with a built-in battery, Bluetooth speakers, removable whiteboard, a tablet stand, LCD clock, two USB ports and much more. The Coolbox has AC pass-through for powering large tools, and a built-in battery for smaller devices when you're away from AC devices. Internal battery: There’s a 20v, 5000mAH rechargeable battery that powers onboard devices and can be used to charge external devices and small tools. 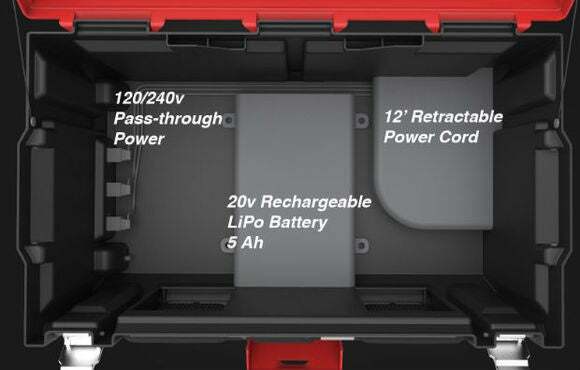 As for charging the battery itself, the Coolbox has a retractable power cord for this purpose. USB ports: The front panel has two USB ports built into it, allowing you to connect any USB-chargeable device. Bluetooth speakers: The front panel also houses three-by-five-inch “marine-grade” speakers that can be connected to an audio source either via Bluetooth or an audio jack. 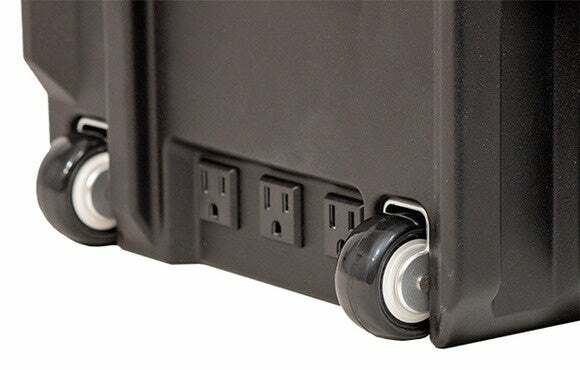 Pass-through power: The Coolbox comes with an integrated 3-way power splitter, so you can plug in additional tools and appliances when there aren’t enough power outlets in your work space. Tablet stands: With the Coolbox having one tablet stand on the lid and another inside the box, you can stand up your iPad whether the box is open or shut. LED lighting: Toolboxes are notorious for becoming possessive about the tools within them, but there’s very little scope for that with the Coolbox. With its “270-degree LED floodlights,” you should have little trouble finding what you need. The Coolbox's wheels make it easy to drag across smooth surfaces. All that attention to detail will set you back $299 if you choose to wait until the Coolbox’s retail debut later this year. Back the product before March 27, when the campaign ends, and you can snag one for $179. 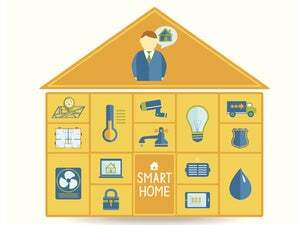 That $120 discount is available as part of the “Earlybird Extension” offer on Indiegogo. Why this matters: While giving a previously dumb object a smart makeover doesn’t take much—a couple of wireless radios here, a few sensors there—the end result can often be underwhelming and the ensuing product no more usable than the original. The Coolbox’s makers, however, seem to have poured in enough effort to make it a considerable upgrade over your traditional toolbox.